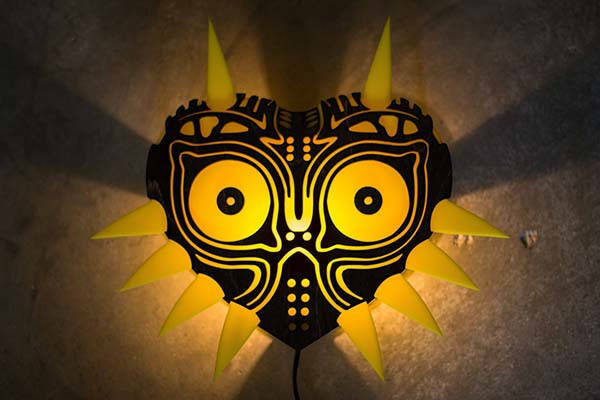 The handmade Legend of Zelda Majora’s Mask wall lamp not only delivers soft and comfortable light, but also brings some mysterious aesthetics from the classic video games series. Like the idea? Let’s keep checking. This is a well-crafted and eye-catching wall mountable lamp inspired by The Legend of Zelda, and handmade by TheBackPackShoppe, a handicraft studio from Texas. Similar with the Zelda cufflinks, the lamp is shaped as Majora’s Mask, a powerful ancient artifact in the universe of Zelda. Using silhouette style and soft lighting, the wall lamp accurately recreates the heart-shaped form factor and iconic detailing from its original look. The Zelda wall lamp measures approx 11 inches across, and it’s built with a sturdy birch frame and facing, coupled with a vibrant yellow acrylic. Using a keyhole style hanging opening, you can easily mount it on the wall. And the included 40W incandescent bulb casts comfortable light through the acrylic details. Moreover, the lamp comes with a 6-feet cord with an integrated rotary-style switch so that it can reach any power source in the room, and you can also easily control it. 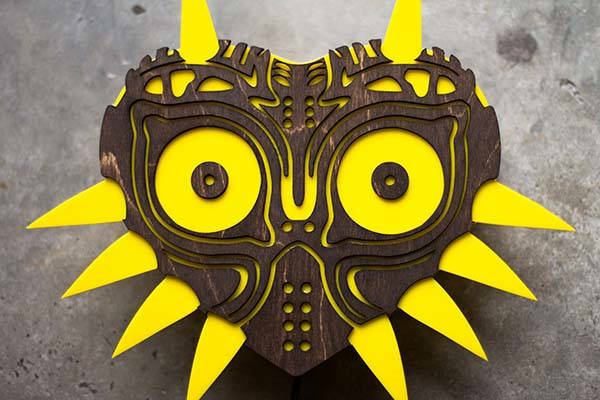 The handmade Legend of Zelda Majora’s Mask wall lamp is priced at $54 USD. If you’re interested, jump to Etsy for its more details.